What Skis Should I Buy? Trying to find the perfect ski? After looking through websites, checking the latest gear guides, reading online reviews, and browsing the ski selection at your local gear shop, do you feel totally overwhelmed? Picking the right ski can be challenging. Everyone likes something different in a pair of skis. The best skis for the guy who skis 144 days a season and works at the tune shop are not going to be the perfect skis for the petite gal on her one-week-a-year ski vacation. Choosing the right ski is largely a personal choice. Should You Buy Or Rent Skis? It's your responsibility to sort through all of the different options and choose the right ski based on your ability, your budget, the conditions, the terrain, and other variables. 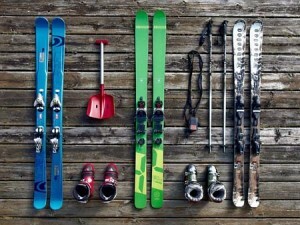 When you see how many ski manufacturers and ski models there are to choose from, it's easy to wonder where to begin?! What type of skier are you? - Beginner? Intermediate? Advanced? Expert? Aspiring Pro? Where do you like to ski? - Beginner terrain? Blue cruisers? Bumps? Trees? Terrain Park? Big Mountain? Backcountry? How many days do you ski a year? - A week? A month? A season? A lifetime? What type of conditions do you ski? - Groomers? 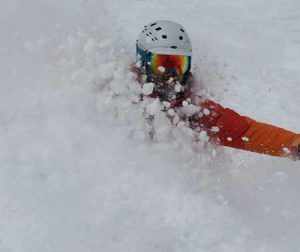 Bottomless powder? Variable crud? A mix of everything? All Mountain - Ideal for groomed terrain, moguls, and tree skiing. Beyond the type of ski, every ski has it's own set of variables (length, width, rocker, stiffness, camber, graphics etc). You'll also need to pick bindings and boots too - but that's another topic. In an ideal world we would all have a quiver of skis. Then we could select the best ski based on the conditions and our goals for the day, but that's a bit unrealistic and price prohibitive too. You're going to have to choose the right skis for you. One great thing you can do at Big Sky Resort (and other resorts) is visit a demo shop where you can test skis. Then you can try different types of skis and find the one that you like the best before you buy. Are you still wondering, "What Skis Should I Buy?" Stop by any of the ski shops in Big Sky and ask their advice. Shops like Grizzly Outfitters, East Slope, GAS, Big Sky Sports, and Lone Mountain Sports are more than happy to help you find the pair of skis that's ideal for you. 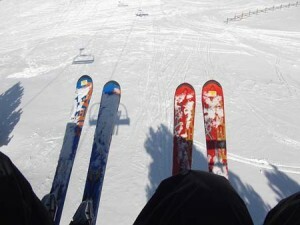 Read more about how to choose the right ski for you on Backcountry.com and on Evo.com.